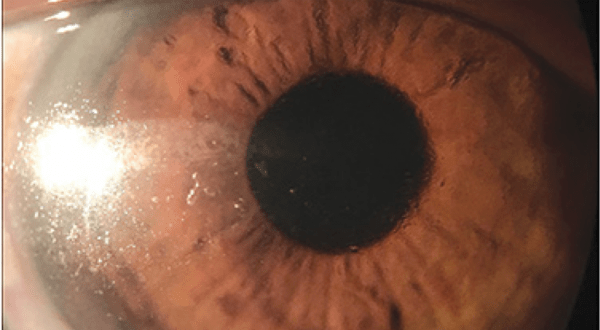 A 71-year-old man presented to the Miami Contact Lens Institute for a scleral lens refit. He was wearing his scleral lenses but complained of significant lens awareness and foggy, dirty lenses. He reported having worn the lens only four times since they were originally dispensed because of discomfort. A review of his ocular history revealed severe keratoconjunctivitis sicca caused by Sjögren’s syndrome and acquired toxoplasmosis of the left eye. The patient reported that the latter was no longer active but that owing to a recent flare-up, he had retinochoroiditis, leaving him with very poor central vision in that eye. He had no history of glaucoma or trauma and no family history of ocular disease. In addition, he had a history of hypertension, hyperlipidemia, anxiety, depression, and prostate cancer. Figure 1. Right eye with scleral lens in place showing significant deposits on the temporal and central portion of the lens. After the lenses were removed, the ocular surface was examined with a slit lamp. The corneas had mild diffuse staining, as did the conjunctivae. The patient had a low tear meniscus in both eyes. He had flat irides and mild nuclear sclerosis in both eyes. No proptosis or lid abnormalities were observed in either eye. After instilling one drop of 0.5% proparacaine hydrochloride ophthalmic solution at 11:00 AM, intraocular pressures were measured by Goldmann applanation tonometry as 13 mm Hg OU. On dilated fundus examination (after instilling one drop of a solution of 1% tropicamide and 2.5% phenylephrine OU), the cup-to-disc ratios were 0.2 OU. The neuroretinal rims were healthy and pink in both eyes. The macula was clear and flat in the right eye, but the left eye had a very large, white/yellow scar extending from the macula to the peripheral vascular arcades. The vitreous was clear in both eyes, with no signs of active inflammation. The retinal vasculature was of normal course and calibre in both eyes, and no breaks were observed in the retinal periphery. OU: SPH -3.25 CYL -0.75 AX 090 Diameter 16.0 BC 8.0 Material: Optimum Extra. The resulting visual acuity was 20/40 in the right eye and 20/400 in the left. The patient immediately reported improved comfort, decreased sensation of the lenses and major improvement in vision. On slit lamp examination, the lens surface appeared much smoother and was essentially free of deposits (Figure 2). These lenses are custom-made for each patient and are fitted in a way to vault the cornea and maintain a constant reservoir of fluid between the lens and cornea to ensure that the cornea remains hydrated. This fluid reservoir acts as a liquid bandage that protects the ocular surface from the environment and from friction caused by blinking the eyelids. It also compensates for surface irregularities, leading to improved vision. Other types of contact lenses may be limited by the compromised state of the ocular surface. Scleral lens designs can overcome these challenges. They work especially well for vision correction because the fluid layer helps smooth out defects caused by dry eyes, providing a more uniform refractive surface. In summary, by upgrading the material of the patient’s lenses and adding the Tangible Hydra-PEG™ coating, we were able to improve his comfort and increase his wear time. He was able to wear the lenses comfortably for 12-16 hours per day and reported substantial improvement in his dry eye symptoms. 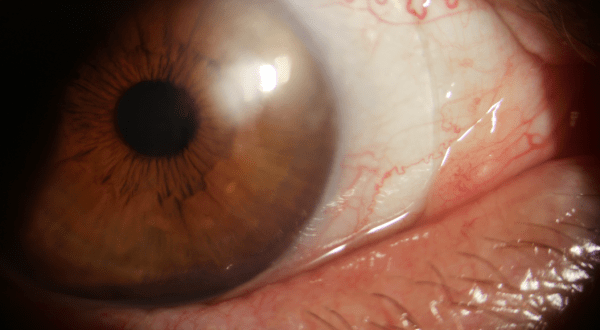 With the increasing recent interest of clinicians and manufacturers, scleral lenses have become “mainstream” in contact lens practice. Dry eye diagnosis and management have also had an increasing interest amongst practitioners. Eye care practitioners should continuously update their expertise in the area of scleral lens design, which can be an excellent management strategy for patients with dry eye and many other ocular problems. 1. The epidemiology of dry eye disease: report of the Epidemiology Subcommittee of the International Dry Eye WorkShop (2007). Ocul Surf. 2007 Apr;5(2):93-107. 2. Gayton JL. Etiology, prevalence, and treatment of dry eye disease. Clin Ophthalmol. 2009;3:405-412. 3. DeNaeyer G. Scleral Lenses: An Overlooked Fix for Dry Eye? Review of Cornea and Contact Lenses 2013, April. 4. Bavinger JC, DeLoss K, Mian SI. Scleral lens use in dry eye syndrome. Curr Opin Ophthalmol. 2015 Jul;26(4):319-24. 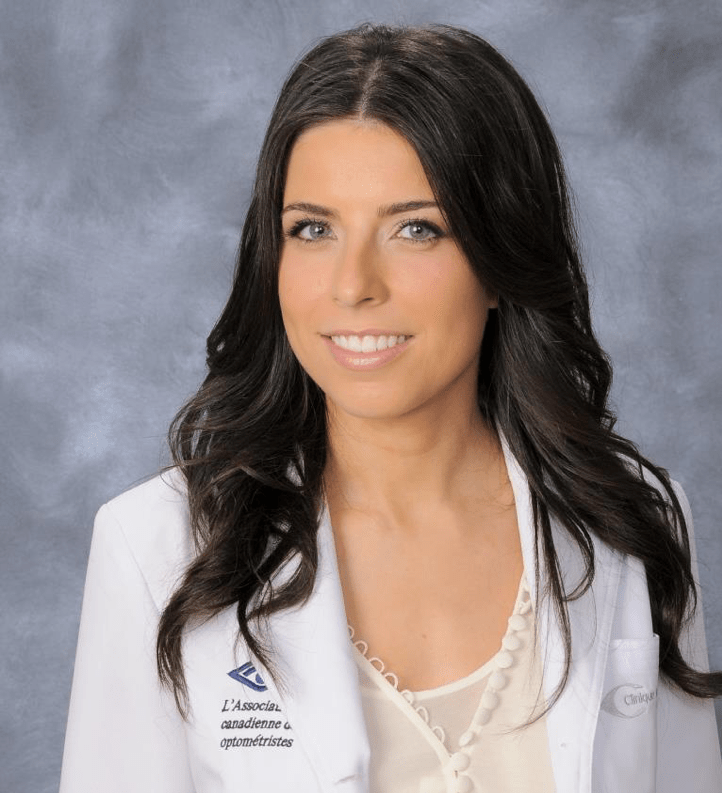 Thank you to Dr. Elise Kramer, O.D. for contributing to Global Insight.